02-Dec-2007 -- With a successfull visit to 27 degrees sth done earlier in the morning, Mark and I continued working our way towards this site. As can be seen from the photos this location goes under water and stays there for quite some time. 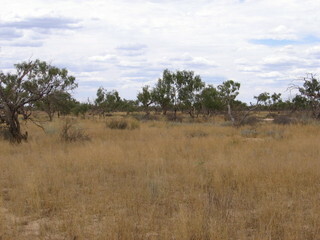 The many Coolibah trees and dense lignum made it hard to get to as the exploration track near this point was almost completely covered in regrowth.